Savoir3: Referring to Savoir, Savoir Faire, and Savoir Être – Ways of Knowing, Ways of Doing, and Ways of Being. To demonstrably understand and embody the three principles of Savoir3 throughout students’ and graduates learning and practice. Emerging: To demonstrate and embody principles of self- and organizational emergence and mindful change. Knowledge Integration: To demonstrably integrate foundational or core knowledge, knowledge created via processes of formal inquiry, and knowledge harvested through active and directed reflection on practical experience in the praxis of leadership, organization development, and workplace-oriented coaching. Complexity: To demonstrate an ability to help organizations describe, assess, and enable appropriate courses of action in terms of complexity as a guiding model for understanding human dynamics. Effect-oriented Practice: To develop and demonstrate the capabilities to facilitate individuals and organizational groups towards becoming more effective with respect to navigating intended and desired effects in complex, workplace environments. 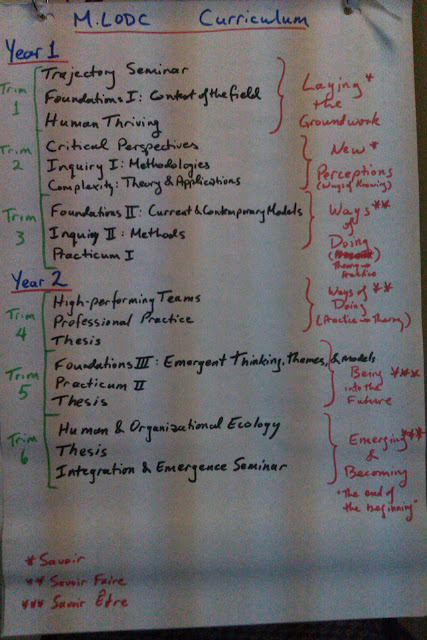 Beginning with these learning outcomes for the program, the small group of curriculum development collaborators participated in a facilitation that invited them to brainstorm competencies that we would intend for our graduates to acquire during their journey through the master’s program. We then took the eighty (yes, 80!) competencies and collectively grouped them into emergent themes (using a silent method based on grounded theory), subsequently naming the themes. Then, using curricula and course descriptions from seven other, well-established university programs that offer master’s degrees in either leadership, or OD, or coaching, we sorted their courses into our themes. This enabled us to discover both the gaps in our thinking, and the missing opportunities among other programs—opportunities that we had identified through our process. Finally, through a series of conversations among the members of our collaboration, we discovered which themes would become courses in their own right, which would meld together, and which better served as threads to be woven throughout the fabric of our master’s degree. 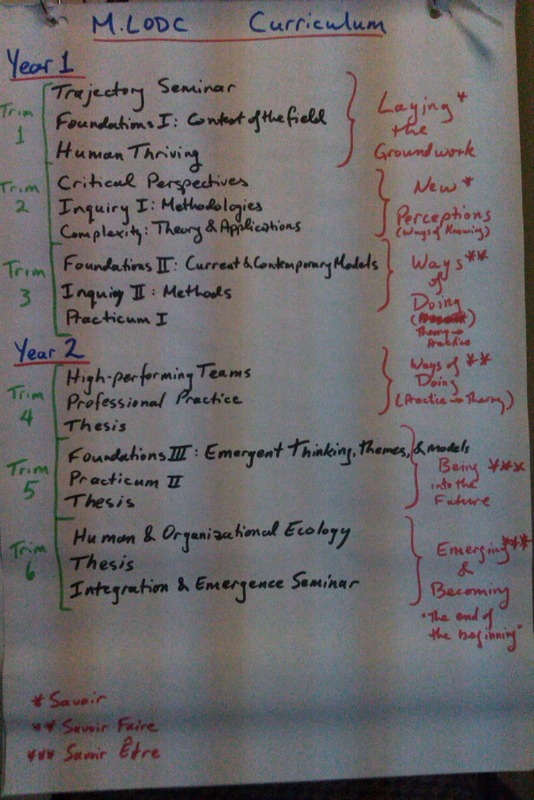 Here is a preliminary outline of the curriculum that we are currently contemplating. Each course would be designed for twelve sessions. Most will comprise nine instructional or content-based seminars, two seminars in which students will present their final work for the course, and one integration seminar. The integration seminar will be a unique feature of our program, one that will set the Adler master’s degree apart from almost every other master’s program. This seminar will be designed to integrate the knowledge from the current course with all of the other knowledge acquired in the program to-date, so that the learning is more holistic and contextualized, rather than distinct and separated by course boundaries. The integration seminars will also include many, if not most, of our faculty so that our professors will understand what is going on in other professors’ courses (the lack of which is a distinct limitation in most university programs elsewhere). The integration is not limited to course knowledge alone. One of the requirements for graduation, post-thesis, is for completing candidates to conduct “integration and emergence seminars” for incoming students. During these sessions, students near graduation will present their research, their reflections on program experiences (both in-class and from their practicum placements), and most importantly, their reflections on their personal journeys of emerging through their time in the program. Incoming students will be able to directly connect with students at the end to obtain an idea not of where they will end up, but of a possible trajectory for their own learning and development. If you would love to take this program and these courses (or if you might like to teach some of these courses in this program) I’d love to hear from you.